Based on our analysis of the James tone stack, let's design our own stack. Our key concerns are the overall attenuation level at midrange and the transition frequencies between bass, midrange, and treble. Greater midrange attenuation facilitates possible bass and treble boost, but requires greater overall voltage gain in the signal chain. The transition frequencies determine the frequency ranges that can be boosted or attenuated. To convert our theoretical knowledge into a practical strategy we translate the equations that determine frequency response based on parts values into equations that determine parts values based on the desired frequency response. This will be demonstrated using a concrete example. For design goals let's set the mid-range attenuation to 8dB at maximum control settings, the bass-to-midrange transition to 500Hz, and the midrange-to-treble transition to 1kHz. With the controls at minimum let's choose a flatter response than the Orange Graphic and set the bass-to-midrange transition to 200Hz and the midrange-to-treble transition to 1.4kHz. Our Bode plots and part value calculations assume a zero-impedance source, infinite-impedance tone controls, and an infinite-impedance load. Here is the actual response using Electronics Workbench Multisim®. The plot assumes a Fender Bassman environment with 1M tone controls. 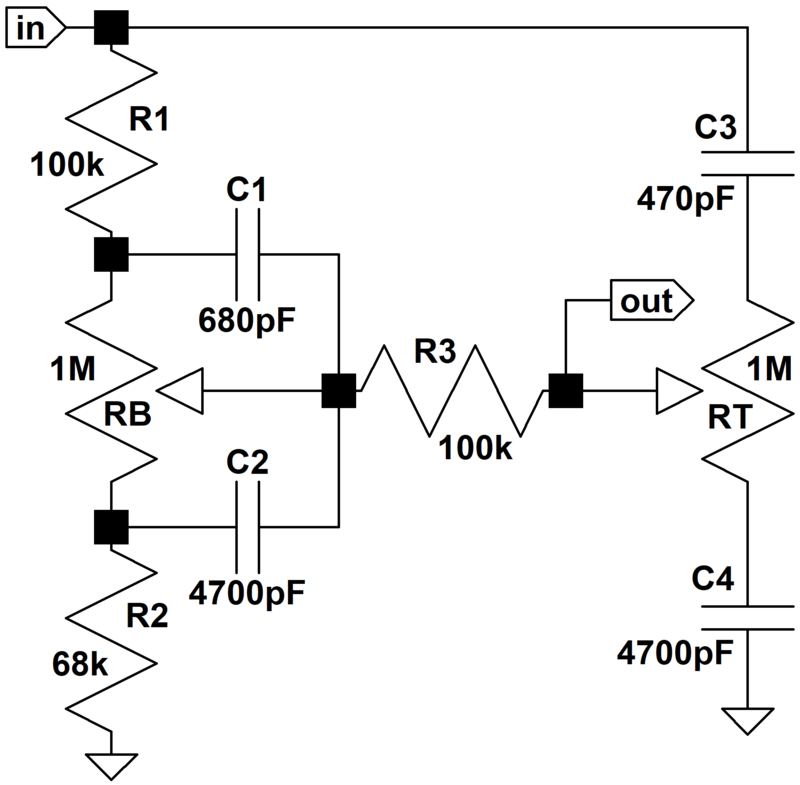 The source impedance is a 12AX7 cathode follower with an output impedance of 500 ohms and the driven stage is a long-tailed-pair phase inverter with an input impedance of 3M. (The horizontal axis is a log scale of frequency from 10Hz to 10kHz and the vertical scale is from -15dB to 0dB.) The next plot below assumes the tone stack is driven by a 12AX7 voltage amplifier with an output impedance of 39k and a follow-on grid resistor representing an input impedance of 1M. There is greater overall attenuation and a slight shift upward in the frequency at which gain is minimum, but the response is not dramatically different. For our design goals of 200Hz and 1.4kHz we get C4 = 4700pF and C1 = 680pF. Here is the response using Electronics Workbench Multisim®. The plot below assumes a Fender Bassman environment with 1M tone controls. 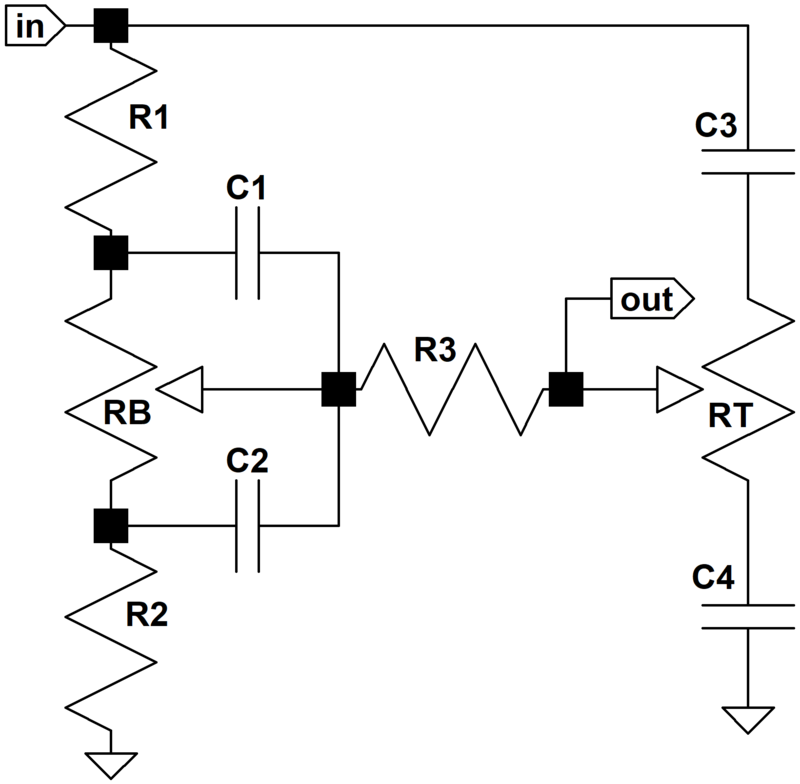 The source impedance is a 12AX7 cathode follower with an output impedance of 500 ohms and the driven stage is a long-tailed-pair phase inverter with an input impedance of 3M. (The horizontal axis is a log scale of frequency from 10Hz to 10kHz and the vertical scale is from -50dB to 0dB.) The next plot below assumes the tone stack is driven by a 12AX7 voltage amplifier with an output impedance of 39k and a follow-on grid resistor representing an input impedance of 1M. If you're getting a feeling of déjà vu, it's probably because these parts values are identical to those found in the Garnet G250TR and G250D amplifiers.